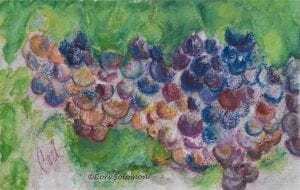 A mixed media piece depicting grapes created using Pastels, Watercolors and grape juice as the background. This artwork was created from a photo taken by my friend photographer Tenley Fohl at the Saarloos Family & Sons Vineyard. This artwork comes matted.